5. 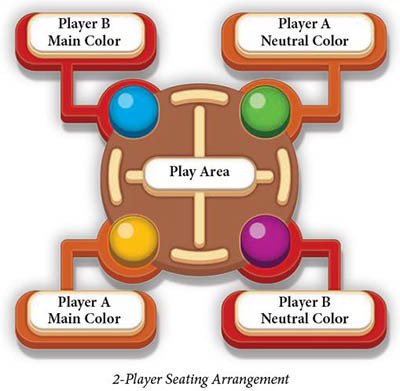 Choose Colors and Arrange Seating: The players sit next to each other. Each player chooses one color to be his main color and the other to be his neutral color. He takes the nine character cards of both colors and all the plastic astronauts of both colors. He places the components of his main color in front of him and the components of his neutral color across from him (see diagram below). 8. Deal Starting Mission: Separate the mission cards, shuffle them, and deal two cards to each main color. 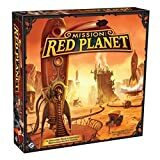 Each player chooses one card to keep, placing it facedown in front of him, and places the unchosen card facedown near the undealt mission cards. 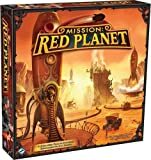 Chosen mission cards remain hidden from other players until the end of the game. 10. Prepare Neutral Character Decks: Each player prepares his own neutral deck. First, remove the Recruiter, Explorer, Femme Fatale, Soldier, and two additional random character cards from the neutral deck. Shuffle the six removed cards and place them facedown. Then, without looking at the remaining three neutral character cards, place them facedown on top of the deck in any order. The two-player game plays very similarly to the standard game with a few minor changes. Each round, before the player chooses his main color's character, he draws the top card of his neutral character deck and looks at it, without showing it to his opponent. He places that neutral card facedown near its deck and then chooses his main color's character card, placing it facedown in front of him. When resolving a neutral color's character effect, the controlling player makes all decisions for that neutral color (where to place astronauts, which ship to destroy, etc).. The controlling player can make a choice that causes his neutral color to kill or replace its own astronauts. When resolving a neutral Scientist, the controlling player draws the event card. If it is a discovery card, he can assign it to any available outer zone. If it is a mission card or an action card, he returns it to the game box without showing it to his opponent. When resolving a neutral Recruiter, the controlling player first returns that Recruiter card to the game box. Then, he shuffles the other eight neutral character cards and places them facedown to create a new character deck for that neutral color. Because character effects are mandatory, there may arise situations when a neutral character effect does not help (or even harms) its controlling player (e.g., the neutral character is a Soldier and the only player who has astronauts in outer zones of Mars is the controlling player). When resolving event cards, treat the neutral colors as separate players for the purposes of counting resources and scoring points. Neutral colors can complete the "Ice Monopoly" global mission. When a color receives point tokens, they are placed in that color's play area. Neutral colors receive point tokens for themselves, so they are not shared with the controlling player's main color. When players compare final scores and the highest score wins.